Lorie Ann Grover's On Pointe is the Readergirlz book of the month. And it's perfect for a Poetry Friday review as it is a novel in verse. How many in my class? How many in the conservatory? Clare trains hard and loves to dance. (I especially appreciate Lorie Ann Grover's descriptions of the pain and the beauty of dancing on pointe.) But Clare has a problem--one that escalates while living at her grandfather's--she's becoming too tall. And there's not much she can do about that. Clare's not alone in her struggles. Her "best friend" in Madame's serious class is Rosella and Rosella has been throwing up to maintain her weight. Dia has grown too big and needs "a big bra" and her hips "are huge." But with the stakes as high as they are no one does much talking. When Dia is called in for "the talk" with Madame, for example, Dia disappears without a word. And no one mentions her absence. Add to Clare's stress her mother's constant mention of "our dream" when they talk on the phone. (Not to moms: don't do this!) Oh, and grandfather--a wonderful, kind, prune juice drinking man six days of the week--becomes a little passive aggressive on the whole Sunday church-going issue. 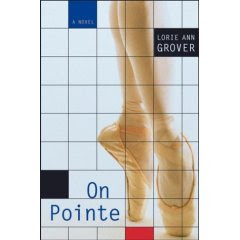 In writing On Pointe as a novel in verse, Grover has chosen wisely from an aesthetic point of view. Clare's personality--straightforward, hardworking, serious--comes through in Grover's spare free verse. On Pointe is for anyone who has ever thought, "Even though I'm trying hard,/failure/could be/my future." On Pointe is highly recommended for children as young as ten and as old as eighteen. I'd also recommend this book to the moms of the world (even the most well-meaning of us can make some big mistakes). Readergirlz has great questions, book group suggestions, and a community challenge related to On Pointe.